Warning! This is no ordinary pizza, but that is to be expected if you want a healthy, vegan, gluten free alternative pizza. This vegan pizza recipe has tons of flavor and texture and is wheat free, dairy free, and soy free. Unlike many gluten free vegan pizza recipes, it doesn’t involve any fake cheese or strange-tasting alternative flour crust. 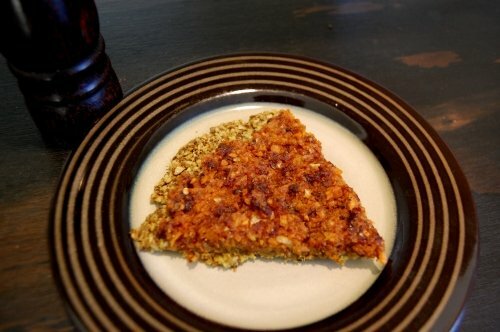 In this yummy vegan pizza recipe we use sunflower seeds and quinoa to provide a crispy, protein packed nutritious crust. Sundried tomatoes and carrots with a splash of balsamic vinegar provide a quick and zesty sauce. It was inspired by the pizza recipes in Thrive, an excellent book on vegan nutrition by Brendan Brazier , a former professional Ironman triathlete. This vegan pizza recipe is super easy to make as long as you have a food processor. If you don’t love using your food processor then it is probably too complicated to assemble or difficult to clean. In that case, I recommend getting the Hamilton Beach 70610 because it is very affordable and super easy to clean – a few parts just need a quick rinse after use and the occasional visit to the top rack in my dishwasher. The only time it let me down was when the bowl fell on the floor and cracked, but that is my fault for treating my dish drying rack like a game of Jenga . Preheat oven to 400° and grease a baking sheet with olive oil. Put all crust ingredients into your food processor and pulse until grains resemble large sand. Scoop crust onto baking sheet and press it down until it is about a quarter inch thick. You can make it whatever shape you like. Next, put all sauce ingredients into the food processor (no need to rinse! it is fine if there is some crust still in the bowl). Add a bit of water and blend until desired consistency is reached. Spread onto your crust and bake for about 40 minutes, or a few minutes longer if you want it crispier. Enjoy! Easy Gluten Free Crepe Recipe: Dairy free & No Added Sugar! Follow me down the rabbit hole . . . Deep Nature Connection Earth Based Living Skills, Free Consultations! Tarot Readings The Tarot expresses to us how we can better understand the patterns we have created, and how we can either change them or enhance them. If you found something of value here, your gift is greatly appreciated.